Unit labour costs (ULCs) are one of the key economic variables considered in the context of globalization, competitiveness and production-location decisions. With the EU accession of eight Central and East European countries and their (almost) full inclusion in the European Single Market, the issues related to the labour cost competitiveness of these countries has become even more important. The present paper outlines the key methodological and practical problems associated with the evaluation of ULCs with a particular focus on the new EU member states (NMS). It provides also new and up-to-date internationally comparable ULC estimates for NMS at both the aggregate level (for the whole GDP) and in the manufacturing industry, as well as for its individual branches. 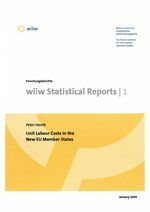 A detailed statistical appendix contains indicators of macro-competitiveness for each NMS as well as data on productivity, labour costs and ULC estimates in the manufacturing industry.